Pittosporum tobira, or Wheeler’s dwarf pittosporum, is one of the most attractive and uniform low growing evergreen shrubs. It looks especially beautiful planted in tropical and asian inspired landscapes; but it is also often used in more traditional designs. Wheeler’s dwarf can also be used in formal gardens to create borders and can be shaped. It has deep leathery evergreen leaves that form dense clusters with a dense mounding growth habit. Wheeler’s dwarf also looks beautiful planted underneath tree canopies and looks best when planted in the shade in hot climates. Plants can tolerate more direct sun in cooler climates. This variety occasionally produces small white flowers with a citrus-like fragrance, followed by small hard fruit. Plants are moderate growers and reach 2-3’ tall and is 3-5’ wide at maturity. Be sure to protect this handsome evergreen when temperatures drop to 10℉ as it can sustain freeze damage. 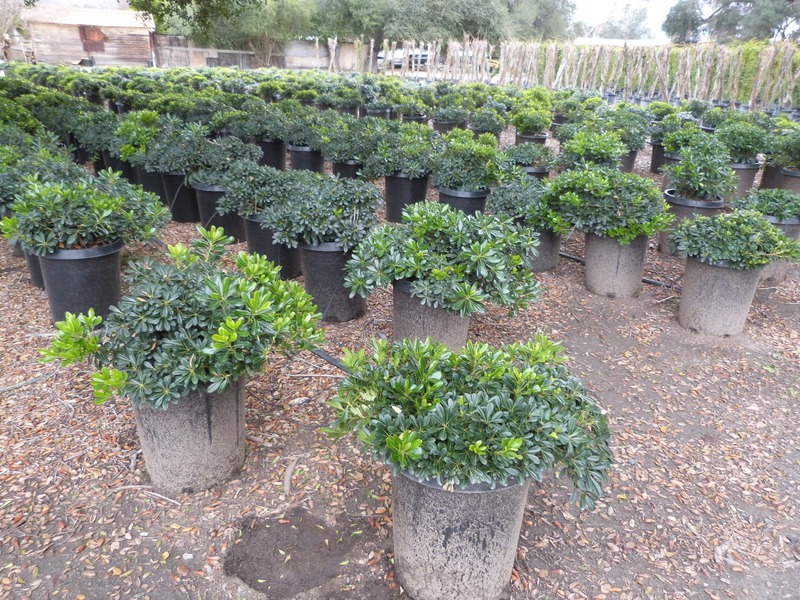 Wheeler’s dwarf pittosporum prefers rich well-draining soil but can handle some soil salinity. Wheeler’s dwarf is typically affected by many pests or pathogens, however soil-borne fungal diseases can be a problem in poor-draining or overwatered soils.